Click here to find out one way to get rid of Creeping Charlie! Thanks Mike for the informative video. I wondered what happened last year growing some grass on a newly leveled spot on our homestead. We actually thought we had the only farm that could”t grow grass 🙂 LOL. I planted a Huge bag of Kentucky Blue grass, watered like crazy couldn’t figure out why nothing was sprouting. Well added more watered again for weeks finally after what seem to be most of the Spring we have grass and lots of weeds. I do wish I would have found your article before now. Live and learn. Love this site. Thanks, Mike for all the great information and inspiration over the years. I just spent hours reading all the posts to your lawn seeding article. At first I thought I was going to have to ask about aerating, liming, and rolling, because you hadn’t mentioned those things in your article, but by the end, your readers had addressed those things. So, you and your community provide a one-stop source for gardening, landscaping, and lawn-care information. And its so entertaining, too. Love to you all. Oh, I do have a question, triggered by one of the posts from a woman who wanted all the ivy she could get.! I used to like it too, and encouraged it around my silver maple, thinking it wouldn’t be able to climb up the shaggy bark. Hah! Now I’m afraid I’ll lose the tree (though many say it would be no great loss)! Is there any way to get rid of it? I’ve been told that cutting it from it’s roots won’t work because it’s now getting its nutrients from the tree and doesn’t need the roots. I also just noticed that I have the same problem at my Baltimore rental property where it has attached itself to my beautiful twin-trunked Katsura tree. Can I inject it with poison of some sort or would that leach into the host tree? Is there any hope?? Thank you for your kind words. The ivy? I’m not sure it’s getting nutrition from the tree, I really don’t believe it. In that regard it works just like Poison Ivy that climbs trees. I successfully got rid of all the poison ivy in a patch of trees simply by first cutting vines down low, then spraying new sprouts as they have emerged with an herbicide. I’d start by removing the ivy on the ground, use a mattock and pull it up by the roots, then cut the vines on the tree in as many places as you can. I’ve removed tons of Ivy from beds, it’s not that difficult to do. Thanks Mike, didn’t know that about Kentucky Bluegrass. Hi Mike, What a great way to treat those nasty weeds. Thanks so very much for your great idea. You have so many good things that you have shared. God bless you and your family. Thanks Vicky, you are welcome. See, here’s the thing. I don’t believe that for a second. I’ve been using Roundup for just about 40 years. My doctor prescribes things for me that are worse for me and worse for the environment. I know that people passionately hate Monsanto but when I walk through any garden store all I see are chemicals, chemicals and more chemicals. They wouldn’t be there if people weren’t rabidly buying them. Very few people have more experience with using Roundup than I do. If it truly did have a residual effect I wouldn’t be able to plant grass seed only days after spraying and have the seed come up and do just fine for years and years. I know I can’t win this argument but I have to be honest in what I believe to be true. I’m pretty sure all the fruit, vegetables and meat that we eat contain a lot more chemicals that people want to admit. Yet if the market had just one wormy apple on the shelf people would go crazy. So true about the topper. I now have weeds in my lawn I never ever had before. Wished I had seen this before I used the seed topper. application. We are entering Spring, so how does his fix work now? The same process works in the spring but be sure to use some kind of moisture retaining mulch. You can buy those green pellets in a bag with some starter fertilizer mixed in. and be sure to water daily if not twice a day. I agree with you and have been using Round-Up for years now. I am up in age, also. I don’t appreciate back breaking raking and digging either. I do it when it is absolutely necessary. But fixing a patch on the lawn is not one of those times. Speaking with the Round-Up people, I was informed that Round-Up actually stops working as soon as it hits the soil. So when you use it, it is only affecting what is growing or seedlings that are just starting to grow. They way I understand it, it does not affect the soil at all. I also, like you, wait a few days after I use it just to make sure any thing that may have been growing or starting to grow will not compete with the wanted grass seed. The tip about the paint is a good one. I never thought of that. It is helpful when you’re trying to remember where you left off. You’re right, but most people are convinced that Roundup is the worst product in the world. But truth be told, the prescription drugs that I consume on a daily basis are I’m sure far worse. I am SO DISAPPOINTED to hear that you endorse Roundup. and …I would guess… GMO grass seed that is resistant to Roundup. How am I able to purchase your book? Not the e-book. I appreciate it too. For shame on you for using RoundUp, which is poison for our Earth and environment. As a devoted/professional gardener, you should be well aware of the organic solutions/products for weed problems, bugs, disease, etc. I’m very sorry but, I would never use RoundUp or any product which is not Earth/Environment friendly. And, may I add, if a lawn is properly taken care of, weeds will never gain a stronghold and the one or two that may appear can be easily dug out with one of those pointed hand garden tools. We must respect and nurture our Earth, our Environment because the chemical companies certainly don’t, they’re interested only in their bottom line. Mike, How can I get rid of clover in my lawn. I also have some creeping Charlie. Love all your letters with the info I need. Lucille, just about any weed and feed product for lawns will do that for you. I just discovered your website through the youtube video’s and it’s very interesting. I will try several tips of yours. How can I get rid of nut grass, besides pulling each piece out? Vivian, nut grass is a tough customer. They do make sprays that are effective on it, but you have to get one that is labeled for nut grass or nutsedge. The other option would be paper grocery bags on top of the soil covered with at least 3 inches of mulch. For nut grass I’d use bags at least 3 layers thick. I love your work and your advise but must take issue with your love of Roundup and other chemical killers. The never-ending harm, illness and death they cause to we gardeners, our pets and our environment must stop. Please do some research on Roundup (glyphosate) and open this link for starters: http://www.organicconsumers.org/monsanto/roundup.cfm This stuff does not ‘go away’. You are a gift to all of us, but this poisoning of our yards and gardens by Monsanto and other pharmaceutical giants must end sometime – and soon. Do you know the weed Paspalum? How do I get rid of it out of my lawn? It is quite widespread. Thankyou for any suggestions. Trish, any time you have weeds in your lawn you have to use a weed killer that is approved for turf. Something that won’t kill grasses but will kill undesireable and unwanted weeds. If a standard weed and feed product won’t take care of this particular weed then you need to consult with a turf care professional because they are ones that have access to specialized products. Thank You Mike for Your Information !!! I need to get rid of these weeds that are green and lay flat on the grass and keep multipling over and over and also spread all around the yard. I Go around the yard and try to pull them up, but it seems like i get 50 more for everyone I Pull up.They are driving me crazy because I want a Lovely yard an Hope to have one soon. Do You know what I’m talkind about? Thank You !!! I liked the video. I will use the information to get weeds out. Tell why all sizes and shapes and color of “mushrooms” grow in various spaces in the lawn? Include moist in the question please! Thanks for the tip! However, the last time I sprayed my lawn with weed killer I was stooopiiid!I killed off branches of two pine trees and all the Burning Bush from over spray. My weeds are in patches, but they are under the drip line of my beautiful 50′ Red Oak. (I’ve never sprayed that part of the yard) I’m terrified to use ANYTHING on them now, for fear of killing the tree. Thank you for any suggestions! Richard, most weed killers will turn into a gas with warm tempperatures(usually over 82). Make sure to spray your area when it is cooler and your trees should be safe. For those who prefer not to use chemicals (RoundUp), you can use vinegar (undiluted) instead. Apply the same way, but it only kills current plants and will not kill future ones as it washes away in a few days. It kills by raising soil acidity in the sprayed area. Bleach also works, but not as fast. I personally enjoy your stuff, Mike. I know you aren’t an “all natural” type and that’s OK. To each his own. I personally use organic methods, but that’s my choice. In the end, you have a lot of enthusiasm for this stuff and that’s catching. Keep it up! Is it possible for a transcript of these video presentations for those with impaired hearing? For anyone who wants to research the application of Roundup on plants and agricultural products. I know you’re rather partial to Roundup Mike, you might want to consider and alternatives weedkiller. there are some things everyone should know before using this product. They make an educated decision and decide for yourself. The link below will show you some of the problems associated with this weedkiller, and also provides additional information about the company and its practices. Love the informative video Mike! Thank you so very much for the tips. We are in Texas, and we really appreciate what you are doing. Happy days to you and your family! Great tip Mike. Looks like I found a new way to solve an old problem. enjoy the newsletters and appreciate the video!! My neighbor has IVY that has taken over and comes into my yard. Roundup turns it yellow for a while but doesn’t kill it. Any tips? It’s trying to take over my azalea beds. Thanks!! Mike, Any suggestions for Clover? I can never get it to go away. When is a good time to transplant a small pine tree smaller that 2 ft.high? spring is a good time, as long as the soil can be worked. Sylvia, the ideal time to transplant anything is when the plants are dormant. Usually between Thanksgiving and April here in the north. I live in Florida and have a terrible time trying to get a nice lawn. What kind of grass do you recommend? Thanks for all your wonderful tips. Mike, Have you ever heard of seeding a lawn through the snow? As I am told, simply apply the seed on top of the snow. As it melts, the seed is drawn into the soft clay-heavy soil below and, come Spring and warmer temps, the seed germanates supposedly better because it has settled in the soil as opposed to laying on the top. Think it will work? Roundup is awful to use. It is very unfriendly to the environment. How and when can I take starts from my Gunnera Manicata plant? I have MANY trees in my yard,thus many leaves in the fall.What is the best way to deal with leaves in respect to lawn health? Should I mulch in the fall and leave them on the lawn,rake and remove in the fall,or leave them there until spring and then mulch or rake? I really enjoy your weekly news letter and find it very helpful.Keep up the good work. Roy in Missouri. Thank you. Roy, you need to either rake and remove the leaves in the fall, or mulch them in the fall. Worst thing you can do is let them lay there until spring. Roy, most of them are too slow for me, but if you are patient they will do the job but are limited in the size of what they will grind. Watch Craig’s list and get a used one. I’m beside myself with wild blackberries on my property…and in my “new ” lawn. I’ve tried Regular Roundup for Weeds and Grass and it won’t kill the darn things! Do you think I could use the Roundup for Poison Ivy and Tough Brush the same way? Meaning spray, wait 3 days, then reseed? Thanks for all your priceless help. Sure, Roundup comes in different concentrations and you might have the weaker solution. Mike, thanks so much for the time, effort and love you give to we gardeners (or wannabes). I love reading your tips. My question: I live in St. Augustine, Fl and have huge patches of a very low growing, tight to the ground, viney weed that looks like a tiny little fern. It is very green, haven’t seen any flowers. I used roundup last year, hoed it up and replanted the grass it had destroyed. Guess what, it is back with a vengeance! I see patches of it springing up in different places around the yard. Do you know what this might be and what to do with it? I appreciate any suggestions you or anyone else may have. Thanks again for your suggestions, tried and true. My husband and I own and run a wedding venue in Texarkana, AR. We planted crown zoysia for our wedding ceremony site. We purchased our grass from a grass farm nearby. We have a sprinkler system that has kept it watered, we have applied nitrogen, lime, fertilizers at appropriate times and done everything we have been told to make it thicken up like we were told it would. We laid the sod a year ago and are still dealing with a thin looking lawn. I was wondering if our well water, which is highly acidic could be causing the problem and if so, what would you recommend? We also have a bumper crop of crabgrass this year. At this point, they’re going to seed, but but none of the seeds have “sprung” yet. We’ve been top-seeding & watering the lawn a whole lot more this year. If I use the anti-emergent next year, it may at least cut through the top layer of crabgrass seeds. But hey! They can still lay dormant for years, an re-emerge in disturbed soil! Yikes! As for the ones creating future brown spots for the time being, I just pick ’em! They’re easy to grab by the crown, and can be added to a cookin’ compost heap! White vinegar, as I understand, or any vinegar, is good- but diluted, about 60/40. Re. : Roundup! A highly recommended method of use! I have a friend who is a certified organic gardener. He was given special training to use Roundup. You need to somehow isolate the plant so that the Roundup won’t touch abutting plants, and protect the soil. A plastic bag might do the trick. Then spray. We’re right next to a wetland, so I feel I should respect all the critters if I can. I don’t use chemicals. They scare me. My area of the Cape has dead ponds from nitrogen, and many wetlands are dying, too! Mike what do you do when you have those pesty skunk holes all over your year Iam in OHIO and skunks are everywhere. to all the organic readers i have found that white vinegar in a sprayer applied to places you want to edge works GREAT !! However i am not sure how it effects the soil where you desire regrowth,I haven’t tried it on any of those places yet. Great idea. I love the back breaking work you have saved me. I can even to do this myself! Now I just need to get rid of the moles and gophers!! Mike, I really enjoy your videos and the information you give for keeping our yard and plants in good shape the “easy” way. I live in South MS and have had a very hot and dry summer. I’ve used Roundup to kill the unwatned grasses in my St Augustine grass. I’ve never seen any St Augustine seeds anywhere, do you have to resod? Is there another grass seed that would be good to use with the St Augustine? Mike, I have crabgrass areas this would be a life saver! Thanks! But I have areas where the burmuda grass just tries to take over the yard. What can I do for those areas? I accept all you tips and look forward to getting them. Can you give me advice about dark spots and some unwanted weeds in a St. Augustine yard? It also has about 4 spots of bahai grass. I can only think the bahai was brought in when my regular person did not come for 3 weeks. I let someone else mow and possibly had bahai on their mower. It has always been a beautiful yard until this summer. Long time fan first time poster. Would a similar process done with Lime or moss killer, rather than roundup, work for mossy areas? I have a growing section of moss in my yard that drives me nuts. Thanks, Mike, for your advice on cutting the undesirable tree down. The problem is that it is in a neighbor’s yard! It grows in their yard, unfavorably close to the fence, shading the red oak in our yard and dropping dead branches in our yard. Mike,I signed up a few weeks ago and have yet to your book.I tried again but was told I already signed up.This is true, but where is the book?I love your tips! [email protected] and I can send the link to you. Mike: Thank you so much for your helpful and practical tips. Really enjoy your presentation as well – simple, unassuming and to the point. I love gardening, but not lawn maintenance, and this year in the Charlotte area it has been very dry, resulting in a lot of crabgrass taking over large portions of people’s lawns. I had some pre-emergent crabgrass killer left over from last spring that I used over some of the patches, but not sure if that will work. Anyway, thanks for your simple tips in managing this menace. Atul, pre emergents for crabgrass have to be applied in the spring, before the soil temperatures get above 45 degrees F. Once the crabgrass is growing you either have to use some type of a post emergent herbicide, or wait for a good hard freeze and hopefully the crabrass dies off. But that still leaves you with large areas of lawn with no grass, and the weeds are sure to come. The drought was the biggest culprit, the crabgrass just took advantage of an opportunity. dear Mike very disappointed you use a posion which goes into the Earth use a piece of plastic put stone over the plastic in half of your time the grass is dead and the Earth is happy try that from now on. I know that some people get mad at me for using Roundup, but I’ve been using it for 30 years and it is by far the greatest labor saving device I’ve ever seen. Everytime I go to the doctor he gives another chemical in tablet form for me to ingest. I do what he says, but I have no idea what’s in those tablets or what the long term effect will be. He’s says they will keep me alive. I wish organic gardening was as easy, or as effective as people want it to be. But it’s not. I hope someday that will change. I watched your recent video about the easy way to fix up your grass if there are weeds. What a good idea! My husband cares for several areas of grass at our cemetery. He can use these ideas there. Can Round-Up be used to kill an undesirable tree that has grown too close to the fence in the yard behind us? I am concerned that the roots of the undesirable tree are intertwined with a red oak that is in our yard and growing 10-15 feet away. The undesirable tree spouted from the roots of a tree that died in our yard. It has never been taken care of and branches break off frequently. I’m sure the reason it has thrived is because of the water and fertilizer we use in our yard. Moreover, it is shading the red oak so the red oak is having to grow at an angle. I’m sure my thoughts about how to take out this tree are prohibited, but I think about it often. I appreciate your thoughts on this situation. My advice would be to cut the tree down, or cut it back severely. Can you use Weed-B-Gone? It doesnt usually hurt the grass, just the weeds. 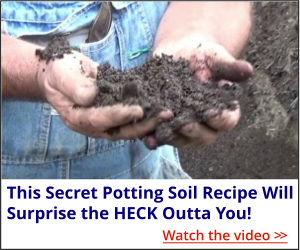 also see the rest of Mike’s gardening videos on the site too. I’m so glad the video was helpful to you! Hi Mike, Saw your comment about “rolling” a lawn. What is that and how do you do it? Our lawn is lumpy and full of holes from heaven knows what. Between that and the weeds our lawn is a mess. Although, this dry summer I have the only green lawn! Weeds are always green! any ideas about levening a lawn. Dandilions and gophers are gone, but their dentsremainwith us still. Gramax, about all you can do is roll the lawn in the spring when the soil is still moist and soft. Some experts don’t like the option of rolling a lawn, but as you well know, sometimes you have to do what you have to do. I hope I’m out there working in the yard at 87! Kudos to you! thank you Mike,i’ve gotten some really good information from your newsletters,my friends tell me i’m a pro now,compared to them.thanks a lot!!! Petuniababi, that’s what I like to hear! Thank you for the kind comments. Do you have tips for dealing with creeping charlie? It is taking over one area of our yard and we’d like to replace it with grass! Thank you. Use the same technique. Spray with Roundup, sow grass seed, water it to initiate germination. Or if there is still some grass there you can use a weed and feed for lawns then over seed like I did in the video. I love love love all of your newsletters and tips and save them all in a folder for when I retire in a couple of years and can landscape our property. Thank you. Love you, love your family!! Nancy, Wow! It’s nice to know that what I do is appreciated and helpful. That’s what keeps me looking for new information to share. You don’t have to wait 3 days to put the grass seed down. Round Up is a contact herbicide, it will only kill something if it is green and growing. You could do the whole process at once. Good tip Mike! I wish it was that simple for my husband and I to do. We live in an age restricted, gated community where we don’t have to do any lawn work. (yea right) When we first moved in to our home 6 years ago, we had nothing but dirt. We hired a local company to start our lawn and he did a beautiful job. Our lawn was green and lush. Then the community told us that we were not allowed to do this and they hired a company that took care of everyone’s lawn. Now we have nothing but dirt and weeds. We had a very dry summer this year and I fear that our grass is so dead that it will not ever come back and if it does the weeds will kill it anyway. What can we do to help our situation and not get in trouble with our association? Any suggestions would be greatly appreciated. We long to have the green and lush lawn that we had 5 years ago. Thank you Mike. Blessings to you. Bonnie, there’s not much you can do except hound the association to fix your lawn. You’re right, if it was as hot and dry there as it was here you’ll be lucky to have any grass still alive. I really, really don’t like associations. Thank you mike, you make it look so easy! Great tip. I have tons of weeds. Mike, I have a section of my lawn that turns brown every winter and thick lush green all summer. What type of grass do I have? Weed don’t seem to survive in this grass. It is spreading across my whole lawn slowly each year. It was that way when I purchased the house in 2006. Wedding pics were great, thanks for sharing with the gardening world. One other thing. I have a veggie garden and always have trouble with borers. What do you recommend. I grew butternut squash this year and two survived. They are huge… more than 12 inches in diameter. How unusual is that. Will take a pic and send it along. Lyn, you probably have zoysia grass. Really best for the south but some northern gardeners love it, even though it turns golden brown all winter. You often see it advertised in gardening magazines and the Sunday paper. You buy plugs, plant them and they spread. I don’t see a lot of it here in Ohio, but I do know where there are a couple of lawns with big patches. A technique I use to kill anything I need to be removed from my properties is Roundup and patients. I have removed small trees and large bushes this way. You just have to have patients and when its been dead for a while it pulls out of the ground real easy compared to before you spray it. Once its been dead for a while the top of the plant is dry and crumbles away with ease. That makes it easy to get a good hold on the base or trunk and pull it out. Even if its so large that I have to use a chain or rope with the riding lawn mower. Saves my poor aching back and makes a big job much smaller. In fact I have sprayed big trees and waited as long as 2 years, but once the tree roots are dead they pull out really easy. As I said it takes patients and roundup. In your video it looks like you may be using roundup as an edging tool. I know I do. It makes it easy to take care of my lawn on all three properties I own. I hate weed eating. At 60 yrs old my back just can’t take carrying that weed eater around so to minimize it I use roundup. This way I only have to weedeat occasionally. I also found a way to sheild the spray tip so that I don’t get the overspray/drifting onto the parts of the lawn and flowerbeds I want to protect. Pehaps you can do a video on this to help your viewers. Phillip, you’re right. I don’t use a weed eater at all at home and keep the edge trimmed back with Roundup. If I edge it with a spade it would take hours and hours and I don’t have that kind of stamina any more. When I offer tips that involve Roundup people get mad at me, but as you well know, it allows us older guys to keep up with our yards. Thanks Mike for another useful tip that I will be using this weekend. Thanks Mike. I didn’t realize that the grass seed isn’t effected by the Round Up. BTW, any quick and easy ways to fix dog pee spots? My husband digs up the dead grass with a rake and then seeds it. Is that the only way? Clare, good question. Possibly flush the areas really well with water then try seeding without digging. I don’t know for sure, but I suppose it’s worth a try on a test area. Thanks, this looks simple enough. Sure looks simple watching you work, Mike. Have you tried the same with just boiling water? I’ve been able to kill dandy lions and poison ivy in our little yard. Might take an application or two, but water from boiled eggs or potatoes, canning, etc, will work. Stephanie: How do you use the boiling water? Just pour it on the weeds? Then what? Want to Thank You so very much for Your Web Site, We have a problem with Creeping Charley weed, we have a Black Lab that we love so very much and do not want to injure him in any way with Chemicals to kill the weed. Have been told to use Lime which the weeds hate but won’t hurt Sam Would appreciate Your opinion. Thank You Richard Irish Jr. Erie Pa.
Richard, the lime will help, but I don’t think it’s going to get rid of the creeping charlie. You can physically remove the creeping charlie or till it in. If you till it, let it set a few days then till it again and repeat this process several times. Each time you till it you bring more plants to the surface to be dried by the sun. doesnt the round up kill the grass seed? Judy, no, roundup will not kill the grass seed, but I do like to wait 72 hours to give the roundup a chance to fully dissapate. look good mike but what would you do with a lot of crab grass, bigger areas? Great tip for a small area, but can I do this for my entire lawn as well? Thanks so much for your expertise and products. Robert, you can and some lawn care companies offer this service. If you are doing your entire lawn, be very careful about the spray drifting onto neighbors properties, and I’d wait until things turn brown so you know that you haven’t missed any areas. You can actually rent an overseeder that scratches up the service a little as you apply the seed. Kevin, you can get a spray that will treat just crabgrass. Or get a lawn care company to do one or two applications. Wow…what a time (and back) saver! How late in the season is too late to try this? Thanks for all wisdom you share, Mike! Michelle, you can actually do this quite late, but if you do when the temps are still warm the grass seed will germinate quickly. In cooler weather grass seed germinates, but it’s a much slower process. Mike, thank you for the grass tips….unfortunately my neighbors do not take care of their grass so we have an entire yard of crab grass. I am going to use this technique for the small areas until I can have the time to re seed everything. Love the tips you give & glad I am able to get them. If you can get rid of the crab in your lawn this year, a pre emergent applied in the early spring should really make a difference for you next year. This year it was so dry in many places that the crabgrass really got the upper hand. I would not use Roundup EVER, I’d rather have the crab grass. Roundup is the worst pesticide known to mankind and is destroying the environment. It should be universally banned in my opinion. Thank you, Carol – well said! I can’t believe that you use Roundup. Haven’t you read what Monsanto is doing to he farms and seeds sprayed with Roundup. Grass seed will germinate as quickly as 6 days in warm temperatures. Blue grass takes 28 days but you should always use a blend and never use blue grass only.